use full when blindwright can't make a back up copy work 100% seems both programs work a like in some ways, when one don't work great for the disk copys there is choice between the two programs for getting a perfect copy, just one lacks features than the other. it used to be one of my fave programs but times have changed & it's not as useful as it was some years ago. A solid program, but not as useful as it once was. Don't know what the reviewer below me is talking about. This program only recently reached v2. There's never been a version 3.47. Maybe he's talking about Daemon Tools? Who knows? Phones home too often, has a rootkit like SCSI emulation driver. I used to love it, but now I hate it. The best version of it was 3.47. Nice burner, indeed. Has a few features that Nero 10 can't offer: virtual CD / DVD, burn disk with low speed, make images of protected disks (this feature is not needed these days, at least for me). This program was good in its day, but it only okay now. The only use for the program that I can see is creating copies of PC Games. The problem with that is the PC Gaming industry is stagnant, they haven't had a hit of their own since Cyrsis. Most companies are turning away from the PC and only Porting their Console games to the PC. This program would be more useful if it made perfect copies of XBOX 360 games like XBOX Backup Creator or Schtrom360Xtract, something unique and progressive. Hearing about their DECEPTIVE MARKETING doubling the price and then sending e-mails making people think their getting 1/2 off is just wrong. I'm glad I never bought from them. If you need it find a way to reset the 30 day trial. I've always enjoyed this software & I'm looking forward to what v2.x will bring us. With the release of version 2 comes our new price structure. So yes, the current price of 39 Euros *IS* half-price of what the new price is going to be for lifetime licenses. Q: When is a "limited time offer" not really a "limited time offer"? A: When it's being offered by a software vendor. Currently the price for a lifetime upgrade license for Alcohol 120% is $57 USD. I bought it for a few bucks LESS than that last year! @4122: I got that newsletter, too, but I didn't fall for it. Don't you see what they did? Double the price, and then pretend there's a half-off special in place. So the actual price stays the same, except they get to advertise a "limited-time special" for as long as they want to, and be extremely flexible with the price by altering that discount as they see fit and as time goes on. Works fine on my XP system. I have bought it since they have a "Special limited half price Lifetime Upgrades offer" at the moment. authors putting more effort in anti-piracy protection than in making their software better. indeed it has some nice features, but i can't rate higher than "2". a burning program should not mess up the OS it's running on (well, this especially seems to apply to certain chipset / driver combinations). that dinosaur cdrwin never let me down, no matter how messed up the system was. alcohol itself is unstable, i'm sorry to say that. Its not 64 bit only. Its covers both 32 and 64 bit. 64 bit coverage is far better than it used to be and AFAIA, there is now no difference in functionatlity between the two. They were a bit slow to implement 64 bit machines but thats all. It does what it needs to do and does it well. Ah, so it's 64 bit, that's why I didn't see it after the setup, rebooted my system. 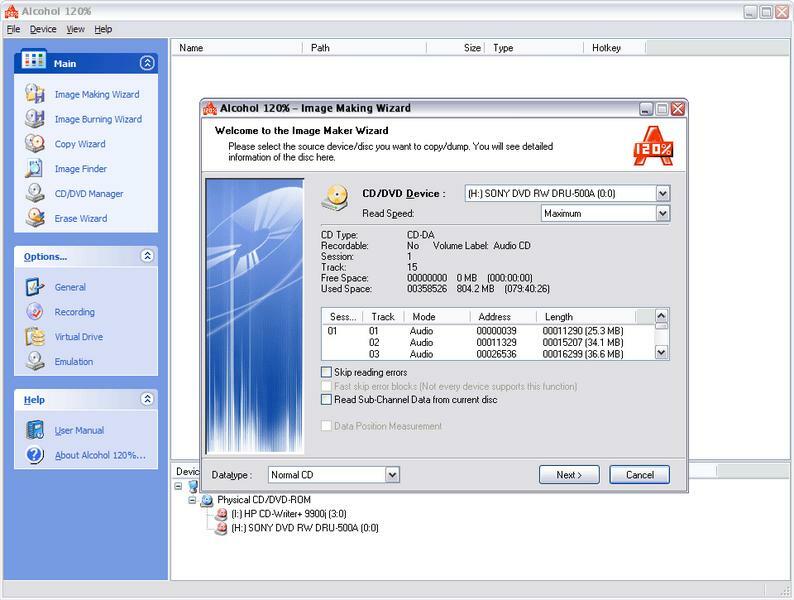 I am looking for a disk image tool that'll load any CD's with out the CD. What a shame. The free version worked for me, but now forget it. I hate 64 bit. Never really caught my eye to begin with. All these horror stories that I been hearing. Come from these type systems. So no thanks, I'll stick to my 32 bit. Prolly have better luck looking else where for a program that does what I want. 64 bit is a turn off for me. im very happy with this Software it covers all my needs for a image tool. I used to have DemonTools Pro Advanced and am very disapointed in its fetures. With Alcohol-Soft I can mount, backup and burn Images with no Problems. I can use Multiburners to burn Multible CDs at once. That Alcohol Supports more and more Hardware and CD-DVD........ Is great and a good approach.